We have a kitchen island with stools and it’s amazing how often we hang around that either just with our kids or with friends when we’re entertaining. Gives me both extra work space and extra spots for people to sit and eat. 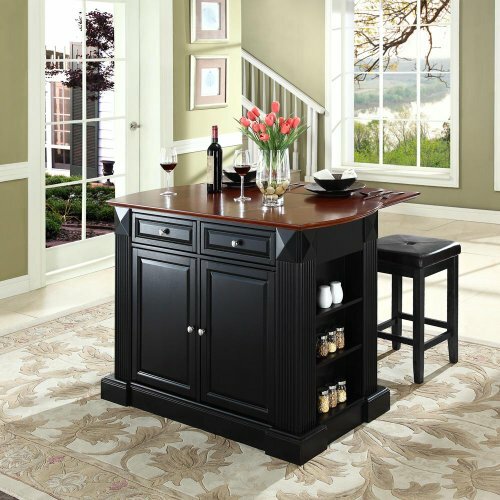 One of the first decisions you will need to make when shopping for kitchen islands with stools is whether to look at stationary or mobile kitchen islands. Then, consider the size of the island to ensure it fits your kitchen and provides seating for everyone. Another important factor is the kitchen island cabinets’ storage capacity. Once you have chosen your preferred natural wood finish or a favorite color, will the height accommodate bar stools or regular countertop seating? A little planning will guarantee you are happy with your choice for years to come. 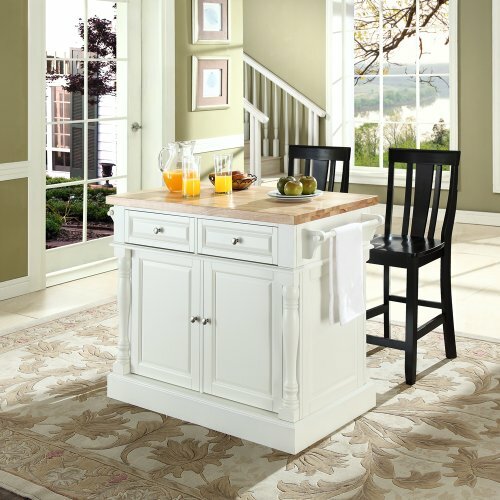 Kitchen island tables with stools and storage are the ideal solution to maximize the space in your kitchen. They provide seating for grabbing a quick meal before heading out, but they serve another very useful function. Free standing kitchen islands also supply extra space to store kitchen paraphernalia. Depending on the size, island cabinets can store breakfast foods, prepping condiments and spices, even some small appliances. A little tight on kitchen space? Not to worry, small kitchen islands with stools can accomplish magic. Seating for two people to share an informal meal, and an extra bit of working area to extend your counter top. 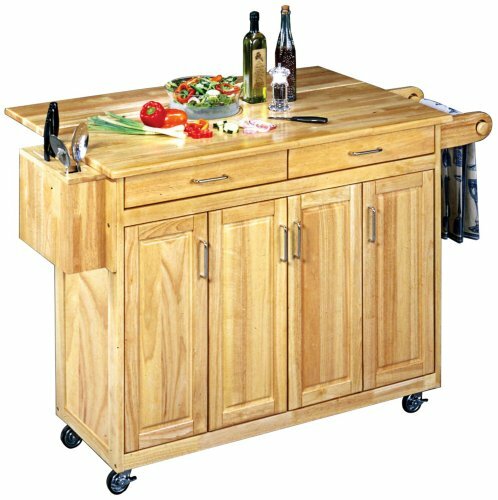 Small kitchen carts on wheels are ideal for tiny spaces. They are easy to move around and simply disappear when you’re done! Can you think of anything more accommodating than a kitchen island on wheels? Extra work space quickly turns into a breakfast bar for a little noshing. 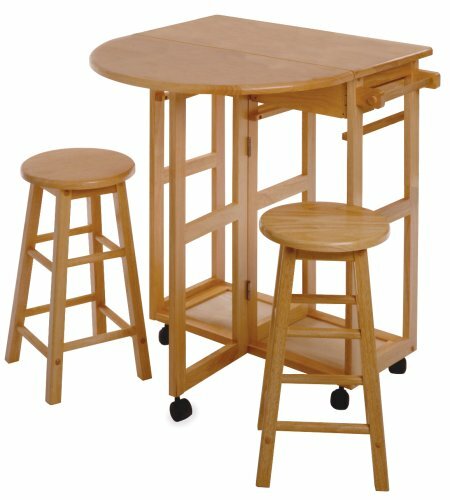 Portable kitchen islands can also easily be moved to wherever is the most convenient for you whenever you so choose. 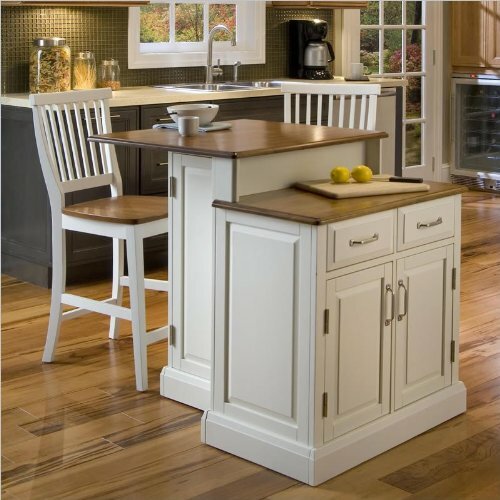 Island cabinets with adjustable shelving can hold condiments, cereals or small appliances. Convenient utility drawers hide prepping tools and/or utensils. Some of these islands even feature a knife block… and let’s not forget a towel rack to help keep everything neat and tidy! If you can spare a reasonable amount of space in your kitchen, nothing makes a statement like a large kitchen island. Not only does it provide you a breakfast bar to sit and have a snack, but a well designed island will have some storage space built in so that everything you need for food preparation is handy. Snacks, dry foods and dishes all at hand’s reach. Either a black or a white kitchen island will always remain classic, whether it is picked to coordinate with your existing cabinets or to provide a bold contrasting statement. A traditional island is the perfect choice to warm up a contemporary kitchen, while a simple, modern one will stand out like a sleek sculpture.